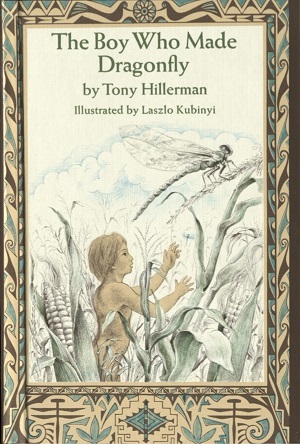 This is the first edition of The Boy Who Made Dragonfly, which is the retelling of a Zuni myth. There are two versions of the first edition the trade and the Harpercrest issues. This is the trade issue, evidenced by the machine clipped lower right corner of the dust jacket and the ISBN. This 1972 edition was published by Harper & Row in New York City, New York. The illustrations in the book are by Laszlo Kubinyi. Format: Hardback, 20.9 x 14.5 cm. Binding: Full-color illustrated board with the author, title, and publisher printed vertically in cream on the spine.